Barth delivered the lectures on Luke 1 that constitute The Great Promise in 1934 before leaving Germany. This situates the lectures before many of his famous theological developments (e.g. Christology, predestination, revelation). This also places the lectures in the midst of the German turmoil before World War II. Barth’s vision for the church as the proclaimer of Jesus Christ occurs in a dark time. When Barth says, “When the kingdom of God is proclaimed, a sign in the concrete world needs to be set up, something definitive needs to become visible…Why the Church is raised up out of the other earthly things in just such a way cannot be answered. The answer consists in the commands which God issues to the Church” (11) he is not speaking of peaceful times. He is speaking of the church in the midst of dark days. In the span of four lectures, Barth works through the birth story of John the Baptist culminating with the praise songs of Zachariah and Mary the mother of God. Through these passages and these individuals, Barth emphasizes the glorious miracle of the incarnation, the nature of God’s calling in history, and the church as depicted in the union of John the Baptist and Jesus Christ. Much like Barth’s Romans, The Great Promise reads more like a commentary. Though showing signs of deep theology, the lectures present the best of Barth’s practical exegesis as he works through Advent associated Scriptures. In conclusion, The Great Promise is an excellent introduction to Barth as a lecturer and an exegete. The lofty prose and long discourses of Barth’s Church Dogmatics are not found here. But the beauty of Barth’s theology is obvious. 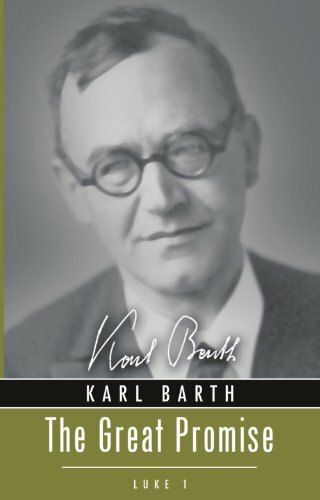 Direct application to the church and the believer dominate Barth’s lectures. Though the name and format might initially be intimidating, all Christians would benefit from reading these Advent lectures.